The following configuration allows you to make Apache forward the request for your domain to a second domain at port 8081. If the user enters “www.domain.com” in his browser he well see the content provided by the server listening at http://www.otherdomain.com:8081/. Since I did not find any documentation for this in the web: If you are using Wt C++ Web toolkit and ever wondered, how to send parameters to a SLOT() there is a simple solution using the boost::bind routine. If you want a script to be executed each time a Network connection is established there is a easy way to do so with Linux distributions which use the Network Manager (like Fedora, Suse, Ubuntu etc.). You simply have to copy the script to the directory /etc/NetworkManager/dispatcher.d and change the permissions to 755. (It is crucial to use 755, otherwise the script will be ignored. The scipts in this directory are executed by the order of their name eg. 10-my-script will be executed before 20-my-script. 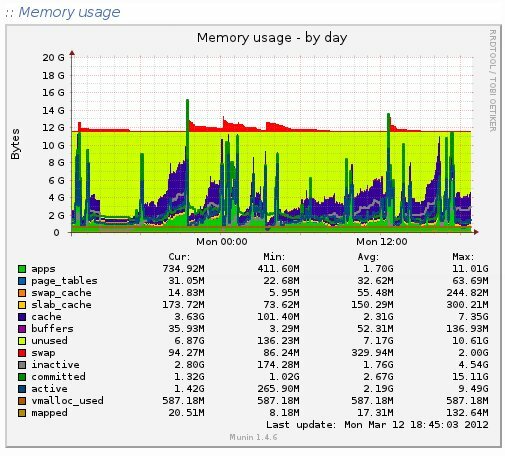 The tool Munin offers an easy way to monitor a webserver. It comes along with a lot of features like monitoring disk and memory usage, the CPU, the fork rate of new processes and much more. The monitored data is accessible by the web browser. The setup of Munin takes only a few minutes. Where Admin is the username. You will be asked for the password in a prompt. If you have two hard disks in you machine and you want to be one and exact copy of the other one you can use the tool “dd” to do so. Make sure, that /dev/sdb has at least the same size as /dev/sda! How long does dd take? Cloning a hard disk with dd can take several hours. Assuming a average speed of 8 MB/s copying a disk with 120 MB would take about four hours. This post describes to configure a web server in a way that it sents its IP address by email in a defined interval of time. This can be useful for example if your server has a dynamic IP address that changes with the time. In this example the tool Postfix is used to sent the emails instead of sendmail since it works similar and is way easier to configure than sendmail. gives you the correct reply everything is working fine. To sent the IP address of you server by emil you simply you have execute the following simple script send_ip.sh by a cron job. http://checkip.dyndns.com/ can be replaced by any web page that is displaying your IP. The only thing that is missing now is to setup a cron job that executes the script in a defined interval of time, lets they every six hours. Now start the crond and thats it! You have to make sure, that the postfix mailing system is always running. In case to ensure that postfix sendmail command is not interferring with the “normal” sendmail command stop it. In this setup www.first-domain.com is displaying the content of /var/www/html while www.second-domain.com is displaying the content of /var/www/samples. For older PHP versions just continue reading. 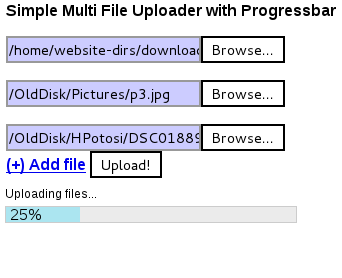 This little PHP Script allows you to upload multiple files at a time to a webserver. It is pretty easy to install and can easily be adapted and extended to your specific needs. The Ajax progress bar the script brings is based on jQuery. For a proper operation of the script the Alternative PHP Cache (APC) has to be activated. Where to get the script? How to install APC on a linux server? In Fedora Linux you need the following packages to install APC using the pecl command afterwards. An introduction how to install it from the source code you find here. If you are not sure if APC is installed at your server contact the administrator. If you want create Audio CDs from your mp3 files using Fedora K3b offers a easy way. To enable K3b to burn mp3 you have also to install the package k3b-extras-freeworld.